This deck, featuring July/August’s Hero of the Month, Eleanor, aims to be a support deck, to be the Bard of the party. It strays away from my typical approach to deck building and having a deck that primarily does X. Instead it aims to do a little bit of everything and to be flexible to best fit the needs of the group and/or quest. My biggest struggle with the deck was making Eleanor matter, believe it or not. Her stats by themselves are pretty meager and so with just her ability she is more of a sideline hero, only noticed when her presence is necessary, lest the encounter deck get away with its nasty effects. With some assistance she can become a reliable defender. However, as the card pool grows this is becoming less worthwhile and better options have appeared (in particular the new Beregond comes to mind). So I decided to run with her just for ability while using the other two hero slots to provide other support roles. 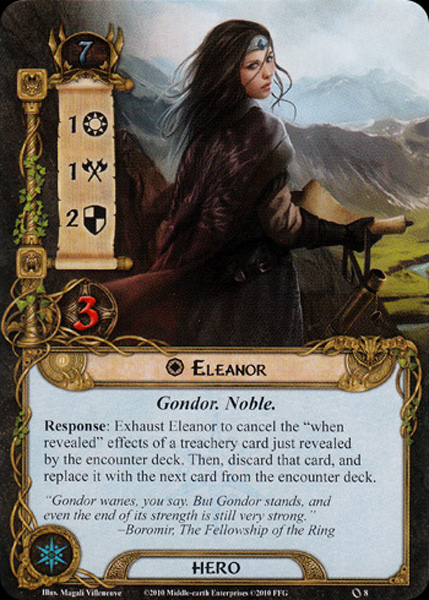 Where Eleanor is there to cancel effects, Arwen is added for her ability to quest effectively. That, and her resource generating ability has the potential to spread to other players while giving this deck a much needed resource push to get crucial cards out. 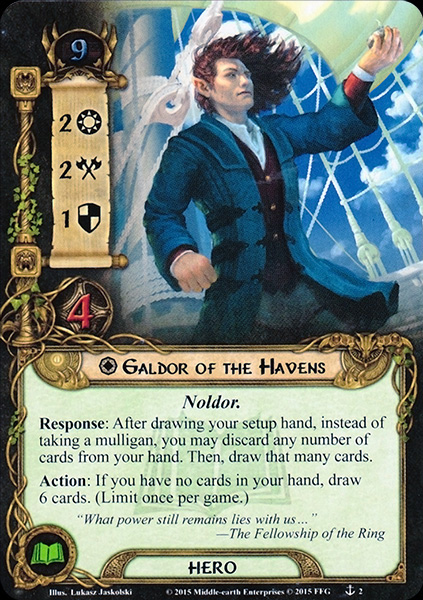 Galdor of the Havens provides card advantage/correction that’s needed in a deck that has a variety of support effects. Too many threat reduction cards? Pitch a few to try and draw some more allies to handle enemies. Do all of your cards handle locations but there are none in the staging area? Let’s dump those into the discard pile and get some cancelation effects instead. Okay. So maybe I lied a little bit. This deck does have an “X” that it strives for. That would be questing. Though I would say it’s only 60% instead of 80% or more. The remaining 40% of the deck can be adjusted using the sideboard or your own general preferences. The gist, however, is that the remaining cards attempt to assist a little bit in combat, a little bit in threat reduction, healing, location control, etc. There are 14 allies in this list. Though a little on the light side, with a little bit of card draw and scry effects, you’ll more than likely hit the allies you need, when you need them. This deck does start at 25 threat, however, so aside from the occasional quest that starts you out with an engaged enemy, it will be some time before you have to worry about combat. 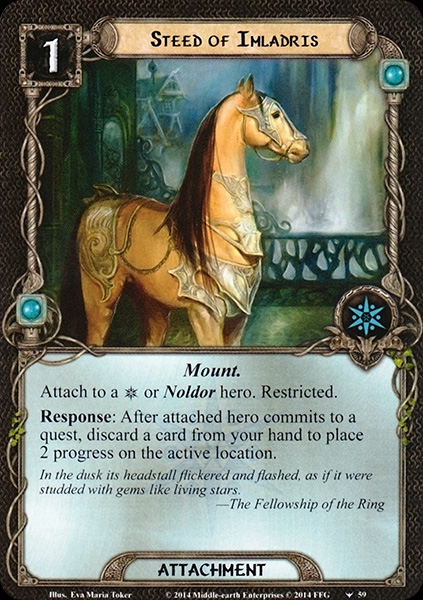 On the questing front, the allied version of Glorfindel makes an appearance, along with some other powerful Noldor. 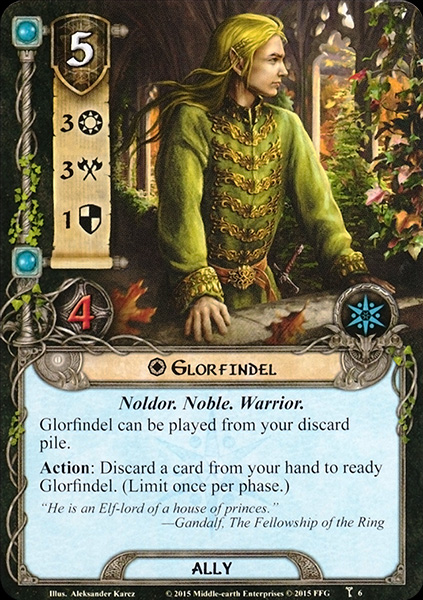 So far Ally Glorfindel has proven to be a great ally to have, and his ability to ready not only helps the deck manage its discard pile effectively but gives us a defender in a pinch. Also helping in the quest phase are 2 copies of the Lindon Navigator and Ghan-Buri-Ghan. The Lindon Navigator has done pretty well but be wary, having to discard a card every turn on top of your other discard abilities can be quite taxing. Otherwise it’s two willpower and wonderful synergy with sailing tests makes it a worthwhile ally. Ghan-Buri-Ghan is a card I’m itching to play but haven’t had the opportunity to do so in testing. Even so, it isn’t hard to see the latent power behind the Wose ally. He’s practically useless on the 1st turn, unless the quest provides an active location during setup, but once you’re dealing with locations with 3+ threat (which isn’t that uncommon), Ghan-Buri-Ghan can have some of the highest willpower seen on an ally (or even some Heroes, I’m sure). His monstrous willpower potential aside, Ghan-Buri-Ghan is a wonderful work around to the increasingly nasty travel requirements we are seeing on locations. Oh and his art is awesome. No effect on the gameplay, but come on! Speaking of locations, there’s the old faithful Northern Tracker. Thanks to Arwen’s ability, his resource cost of 4 is easily ignored. He won’t be coming out in the 1st turn, most likely, but he will more than certainly be out in the 2nd turn and beyond, assuming you have him in an opening hand. Having an ally like him out early on can control the locations before they even become noticed. But you already know this. It’s amazing how useful the Tracker still is, even this far in the card pool. Filling up some of the other functions come a nice selection of Noldor allies. 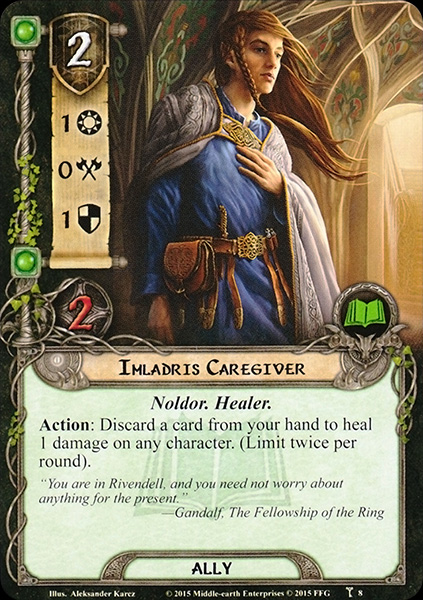 For healing, the Imladris Caregiver makes for a fair alternative to the almighty Warden of Healing. Both allies have their good and bad when compared against each-other but the Caregiver does much better in this deck since its resource cost can be reduced and because it can feed our discard pile. Gildor Inglorian is the deck’s primary defender (if it needs one) and a very strong card advantage engine that can also pack a punch. Like the other high cost allies in this list, Gildor’s 5 resource cost can be mitigated with Arwen’s ability in conjunction with some attachments we’ll look into later. A much weaker, but still useful scryer, is in this list as well. The Imladris Stargazer is included to assist not only this deck in its draws but those of other players too. Lastly there’s the Elven-Jeweler. At only 2 copies, the Jeweler is there to be whatever you want it to be. I’ve used her to empty my hand so I can use Galdor’s ability, to get an extra bit of willpower, or to become an immediate chump-blocker after I’ve committed all my characters to the quest. Of the 12 attachments in this list, 2 stood out to me during plays (and no, it’s not Light of Valinor). The 2 cards in question are Steed of Imladris and To the Sea, To the Sea! The Steed of Imladris is such a simple but robust attachment. It only ever drops 2 progress on an active location, which these days will most certainly not explore it on its own. Coupled with other location effects, especially like the Northern Tracker who chips away at locations, The Steed can turn some of the more demanding active locations into ones that are much more manageable and less threatening. To the Sea, To the Sea! on the other hand, is 100% necessary to keep this deck afloat. With us playing events, attachments, and a smattering of allies every turn our resources will be pushed to their limits. To the Sea, To the Sea, offers a way out, reducing the cost of all but 2 of our allies (which only make up 4 of the 14 cards). 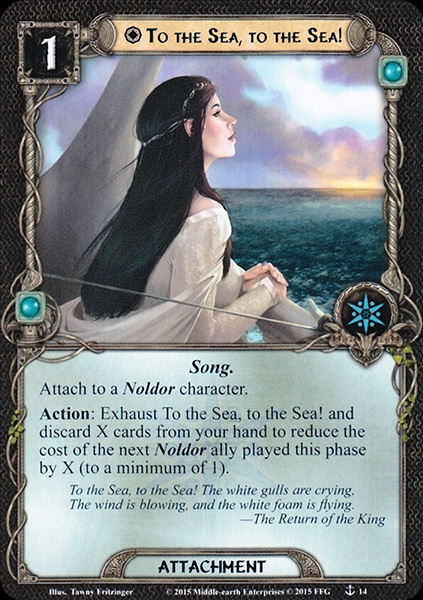 And of course, being a deck that is built upon the Noldor oriented mechanics, it helps feed our discard pile. The jury is still out on Thror’s Key, which I would normally be more than glad to include in a deck like this. It may require seeing a few more different quests, but locations were being handled well enough that the key felt like a win-more card. On the plus side, it isn’t too cheap, and it’s text blanking ability for locations can provide some extra cushion if things go south. Being unique, we can always pitch extra copies to Arwen’s ability if we need to. I mentioned Light of Valinor up near the top of the attachment section. So far, it has felt like a dead card in my hand, at least for my Heroes. 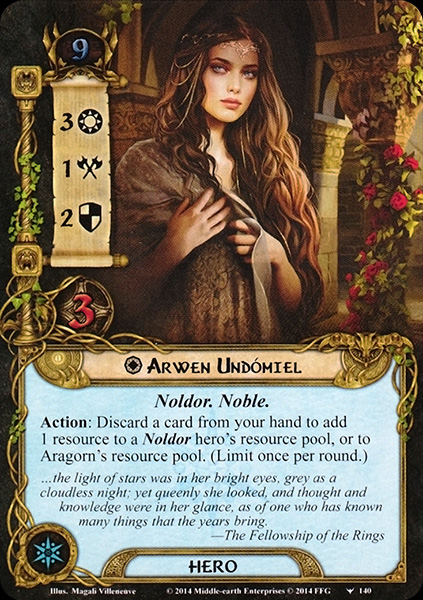 With the prevalence of Noldor and Silvan (at least in my local meta) I was more than happy to toss it on a Hero belonging to another player, which in my last game worked quite well. What I may do, however, is trim the 3 copies down to 2 and complete my play-set of Lembas. 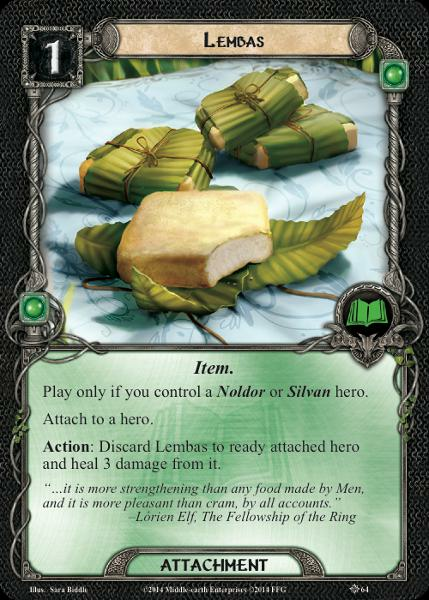 With only 2 copies in the deck so far, Lembas not only provides a readying effect to any Hero in play but some excellent healing that is less demanding on our cards/resources than the Caregiver. In one game, I even put Lembas on Eleanor, committing her to the quest during one of those YOLO moments, and immediately triggered it to keep her ready for cancellation. If you showed me a Lore event instead that said “1 resource – ready a Hero and cancel the when revealed effect of a treachery and give another hero +1 Willpower” I would most definitely throw that in my deck. So even in a janky situation like that, Lembas can be put to good use. The events make up nearly half the deck, coming in at a count of 24. I’ll break them down into categories as I go through them. Daeron’s Runes, Elven-Light, and Heed the Dream are this deck’s form of card draw. With each card having 3 copies a peace in this list, that means we have 9 total cards in our deck of 51 that will help us draw into more useful cards. 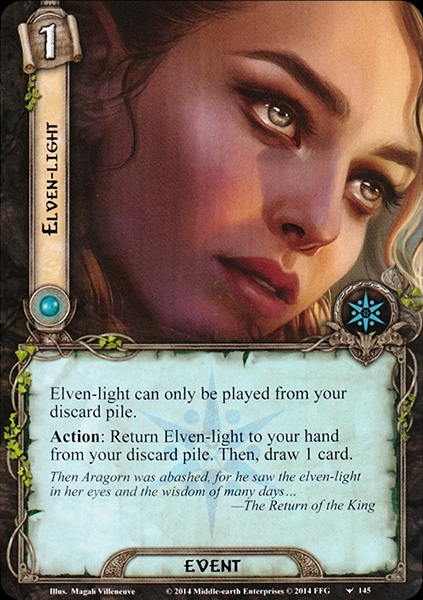 It would be easy to argue that any of these are great to have in our opening hand, but if you can, I would mulligan for an Elven-light since it works beautifully with Arwen and also has the potential to be recurred over and over essentially pushing our number of “draw” cards beyond 9. Daeron’s Runes is great to draw into and I can’t help but giggle a bit when the card I have to *groan* “throw away” is Elven-Light or Ally Glorfindel. It really ups the quality of an already amazing card considerably. Heed the Dream is probably less like an Elven-Light and more like an improved Imladris Stargazer. This is a decent fall back to have if your mulligans have failed you or if another player is in dire need of a key card. 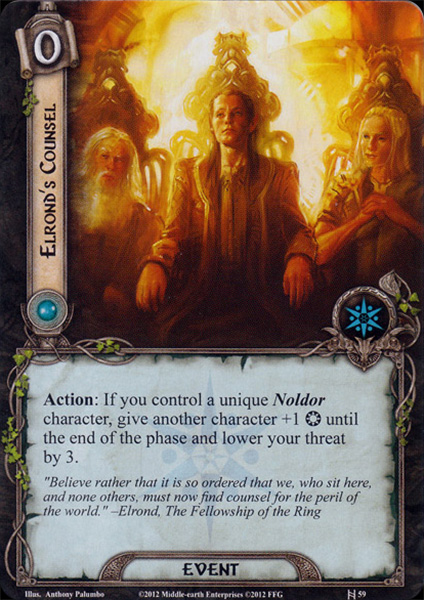 Elrond’s Counsel and The Galadhrim’s Greeting are this deck’s only form of threat reduction with the first being for ourselves and the latter for other players. Elrond’s Counsel is great to have in the opening turns of the game since it will keep your threat around 25, buying yourself more time to avoid combat and to assist other players. The +1 willpower boost may not be noticed in some quest phases but it’s still nice to have. The Gladhrim’s Greeting is mostly there to help that player (or players) near the end of a quest that are close to threating out. If you are in a scenario where that situation will arise more often then you may want to increase the card count from 1 to 2. Handling the various other phases of the round are some classics and some newcomers. A Test of Will is an auto-include. Having 3 copies of this Spirit Event while also having Eleanor means that the encounter deck will have to work hard to trigger any of its nasty effects. After the encounter deck has belched forth some cards, there will ultimately be some that linger in the staging area or otherwise. 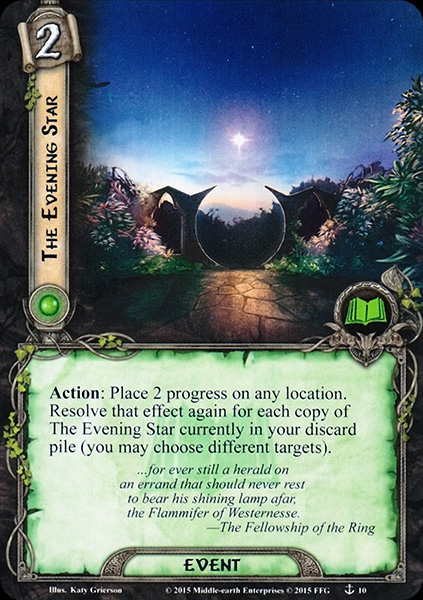 For locations, The Evening Star can be put to great effect in its ability to either push through the active location or by removing multiple locations from the staging area before the quest resolves. If player coordinate their decks effectively then a card like Arrows from the Trees can be played to render most enemies obsolete. Being very situational, deck specific, and resource intensive, only 1 copy of Arrows from the Tress is in this list. If need be, other cards can be swapped to increase the copy count. Lastly is a fun little card that may go to the sideboard more often than not. But when you need it, it’s sure fun to use. 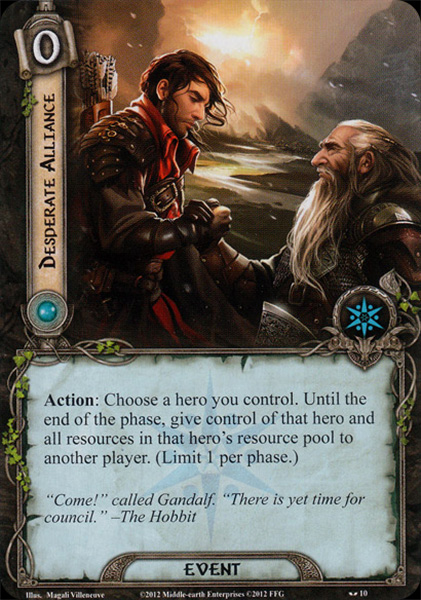 Desperate Alliance, which was once a devastatingly powerful card when combined with Lore Aragorn, finds a fun pairing with Galdor of the Havens. Like Aragorn’s Lore Hero Card, Galdor also has a once per game effect. Where Aragorn resets your threat, Galdor essentially resets your hand. With Desperate Alliance you can send Galdor over to another player (typically during planning or before combat would be best) and if they are out of cards they get to breath new life into their game, drawing back up to 6. In some quests, this will be little more than a “nice card to have.” In others, especially those quests that force multiple discard effects, Desperate Alliance can be an amazing life line for a struggling player. I’m happy to keep 2 copies in the pre-sideboarded version of this deck, and will only feel the need to remove it during certain scenarios or when my fellow players have enough of their own card draw. Gather Information is still one of the best cards currently released, in my opinion. And in a deck such as this absolutely needs to have the ability to get that one card needed to get the players out of a nasty spot. The fact that it helps other players as well makes this card even greater. It’s well worth having it as the 51st slot! I’ve been having a ton of fun with this deck. Though I wasn’t shelling out large amounts of willpower, I wasn’t dishing the lowest either. On top of that, being able to mess with the encounter deck in various ways, either via treachery cancellation or location control, felt a lot better than focusing on just one of those strategies. As for some tips, I’ve already mentioned that Elven-Light should be mulliganed for whenever possible. Going down a list of priorities, To the Sea, To the Sea, is another card that is worthwhile to have in your opening hand (or at least having a way to go digging for it). For Allies, it’s not the worst being stuck with a Glorfindel in your opening hand either. He can be pitched to Arwen or, if you’re lucky, a first turn To The Sea to get himself (or any of the Noldor allies) out quickly. Given the toll that the Lindon Navigator takes on our hand it can be swapped out for the Sailor of Lune found in the Sideboard. Since half the deck is full of events, and some of them can be quickly made to be on top (see Elven-Light), the Sailor’s bonus will almost always be online. It’s immunity to damage while questing is quite the boon in some of these more recent quests and again, just by not being the Navigator gives our hand a little more breathing room. If locations are negligible, then the Northern Tracker can be exchanged for anything. Any of the Spirit cards in the sideboard (even the 3 costed Lindir) are cheaper than the tracker, freeing up the Spirit resources for more Glorfindels and Test of Wills! This deck will be seeing some more plays from, and I’m strangely enough looking forward to tweaking the sideboard the most. I’m mostly satisfied with the current deck list, finding that (aside from one or two cards) it handles what it sets out to do well enough. It’s when a quest leans heavily towards a particular strategy that would test the limits of the deck and having a sideboard that can adjust on the fly would be excellent. Let me know what you think of this deck, and any Eleanor builds with which you may have had recent success. I’m itching to get some more Eleanor love on RingsDB. I’ve mentioned this before (as have many others) that she is woefully underrepresented on those lists. Using Galdor with Desperate Alliance is a great idea. I would be happy to play across the table for this deck. Isn’t it! I was playing The Passing of the Grey Company and it makes all players discard their hand in the first round (or 2nd, can’t remember). I used Galdor to draw my hand back up and the following turn, drew desperate alliance, resetting my partner’s hand as well. Worked great. I’ll admit. I didn’t come up with the idea. I either saw it on Discord or RingsDB but didn’t write down who said it. The fantasy writings of a late twenty-something looking to spill his thoughts somewhere.